From ancient Greece to Pompeii, from China to Turkey and beyond, street food has a long and colorful history. Today, around 2.5 billion people eat street food every day. Especially in Asia, street food has become an urban mainstay and is part of the local food scene in large cities and small towns alike. Many Asians buy the ready-to-eat foods and beverages on their way to work or during their lunch breaks. Consumers come from every social class and businessmen are often seen eating their lunches next to construction workers from the countryside. The benefits of street food seem to be apparent to everybody: It is cheap, easily accessible, often nutritious, and offers an endless culinary variety of traditional dishes for every taste. In times of urbanization, street food microindustries play a crucial role in the social inclusion and participation of vulnerable groups in big cities. Urban population growth has stimulated a rise in the number of hawkers in metropolises throughout the world. Since street food enterprises are generally small in size and require only basic facilities and skills for the preparation of food, just about anybody with a small amount of capital can set up a food-stall. The potential gains in income are appealing for newcomers to the cities. 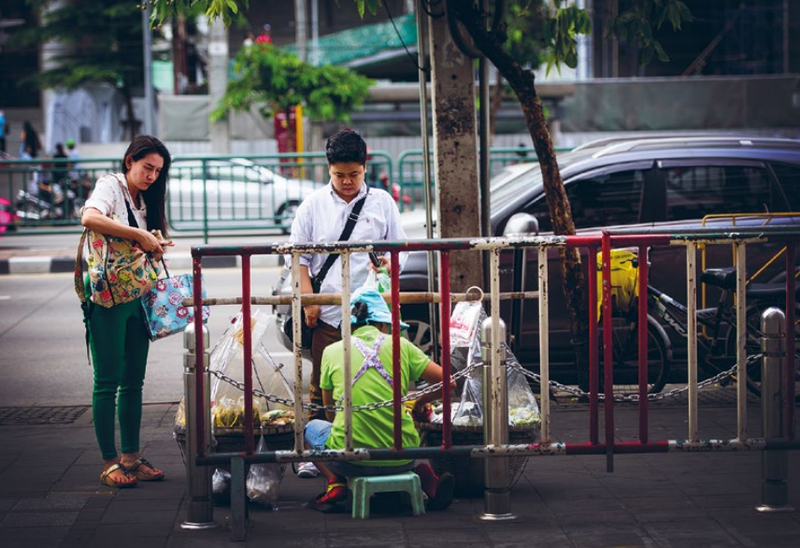 Many migrant workers who are in search of employment obtain their first income from selling foods and beverages on the street. Women, who play a great role in preparing, marketing and selling street foods, have also benefited from the sector. These micro-industries offer important employment opportunities to many women, enabling them to make a living of their own. The expansion of the street food sector is also being favored by a change in eating patterns. Due to the migration from rural areas and foreign countries and the resulting living conditions, many working people need to eat outside their homes. As a result, the demand for relatively inexpensive, tasty ready-to-eat food has increased as people have less time to prepare meals. The street food industry is therefore an important first job-provider for many people and prevents vulnerable social groups from slipping into poverty. By offering business opportunities, the sale of street food can make a sizeable contribution to the economy of a developing country. The impact of the street food industry on the economic development of a country has long been neglected and underestimated. The reason for this is that the street food industry is seen as a part of the informal sector, which typically describes loosely organized and often non-enumerated economic activities. This makes it hard to collect solid statistical data. Yet, from an economic perspective, the division between the informal and formal sectors is not always clear. Suppliers and consumers may «cross sectors» to exchange goods and individuals may be active in both formal and informal economic endeavors. Street food is not only appreciated for the role it plays in the cultural and social heritage of societies, it also has become an essential pillar in the provision of food to the population. In fact, street food is crucial when it comes to maintaining the necessary nutrition status for large parts of the population. Those with little or no income depend almost exclusively on food supplied by street food vendors. For many, the food-stalls are the least expensive and most accessible means of obtaining a nutritionally balanced meal outside their homes. Thus street food can be a key element in the improvement of food security worldwide and in Asia in particular. Governments and public health authorities nevertheless remain skeptical of street food and fear that an unregulated street food industry might lead to a backlash in tourism. Officials are especially concerned about the risk of food poisoning outbreaks, which is often linked to the microbiological quality of the water used to prepare food and drinks. Other sources generally seen as contributing to microbial contamination are the preparation areas, cooking and serving utensils, raw materials, undercooked and improperly stored food and the personal hygiene of vendors. While health concerns about food contamination linked to street food might be legitimate in some cases, the number of documented food poisoning cases stemming from street food has been limited. In fact, the incidence of such is surprisingly low, with a study from 2012 showing rates comparable to normal restaurants.1 Epidemiological studies suggesting that street food contributes to a significant number of food poisoning cases are inadequate due to deficiencies in knowledge about important parameters in the food chain and host pathogen interactions. It is rather more likely that the health risk of food is not only determined by the concentration of various additives and other contaminants in a food product, but also by cumulative daily intake of certain contaminants or additives throughout a consumer’s diet. Against this background, politics should move away from putting the street food industry under general suspicion, and start informing consumers and hawkers about the benefits of a well-balanced street food diet in order to fight malnutrition in Asia. Providing access to safe water supplies for street food stalls would be a first important measure to promote food safety. For instance, authorities could oblige the street food industry to harvest rain water, which if treated properly can serve as a fresh potable water supply and has a better microbiological quality than water collected from local family wells. Such interventions would ensure safe food practices and improve people’s nutrition. Besides improving the environmental conditions, authorities could also focus on educating the food handlers in hygienic standards, since the lack of knowledge among hawkers is often the core problem of malnutrition. Moreover, the adoption of good agriculture practices through hazard analysis would significantly reduce risk in the street food consumption. It is clear that street food can be paramount when it comes to food security. Given that millions of people depend on this source of nutrition, street food will certainly continue to evolve and tempt passers-bys to stop for a snack or a drink. Unfortunately, the political mills are grinding rather slowly. Only in the late 1990s did the United Nations (UN) and other organizations begin to recognize that street vendors had been an under used method of delivering fortified foods to populations. In 2007, the Food and Agriculture Organization (FAO) recommended considering methods to add nutrients and supplements to street foods that are commonly consumed by a particular culture2 . Although these are first signs of a rethinking about street food, these recommendations are not sufficient and have not been echoed by all developing countries. To enable official recognition and control of the street food industry as integral part of the food supply, appropriate regulations should be prepared and incorporated into existing food regulations. Above all, active collaboration of all stakeholders, including consumer associations, toward the strengthening and proper enforcement of public health policies to ensure safe practices and a safer and healthier society is needed. 1 Rahman et al., «Food Safety Knowledge Attitude and hygiene practices among the street food vendors in Northern Kuching city, Sarawak»: Borneo Science 31; September 2012. 2 FAO, «Promises and Challenges of the informal food sector»: FAO 2007. The oil palm is one of the most efficient oil crops in the world, yielding several times the amount produced by other major oil-bearing crops. Its high productivity, competitive price, accessibility for poor households, and versatile uses have driven exponential growth over the past 30 years (USDA-FAS 2009) and secured its place as one of the most important resources in the food industry today. In this edition of Perspectives Asia, the authors highlight certain aspects of politics of food and seeks to illustrate some conflicting issues in the field of food and nutrition in Asia.